Today, I used up the last of our stored potatoes, turning them into soup for tonight's dinner. They weren't much good for anything else, all shrivelly and going soft and putting out seriously desperate roots. Soup was good, though. I'm thinking I'll drape the potato box with heavy black cloth next year, on the theory that the opening and closing of the pantry door, not to mention turning on the pantry light, for the last six months has provided enough stimulus for the potatoes to think they should start getting ready to make more potatoes. Perhaps a colder environment would be helpful in stretching out The Duration of Successful Potato Storage. 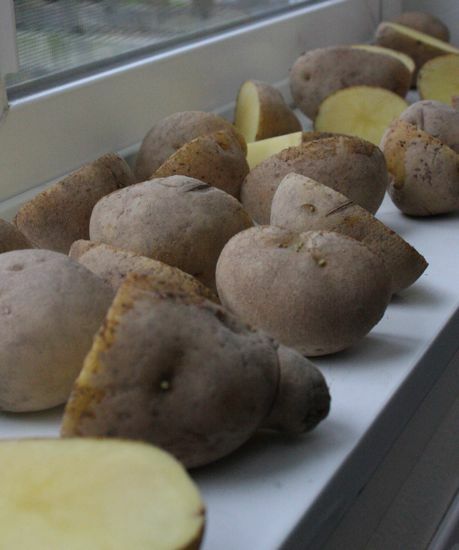 If I can arrange a sufficiently light-proof container, the sunroom in the winter might be sufficiently cold to help the potatoes maintain hibernation just a little longer. And then the Potato Life Cycle as it plays out at our address would have a nice symmetry to it. Because the sunroom is where this year's potatoes get started. The seed potatoes (Yellow Finns) arrived on Friday from Seed Savers Exchange. I wish they offered a small sampler set. I don't have the space for planting any more than the minimum 2 pound order (and that just barely), but I'd love to be able to get a mixed bag so I can plant a couple of the blue potatoes, a few purples, and a handful of reds along with the standard yellows. Of course, I'd want them all to be harvestable at the same time so I could make a multicolored potato salad while it was still summer. The first step in growing potatoes is to cut the large seed potatoes down to something closer to golf ball size, making sure there's at least one eye on each piece. Then put them somewhere warm and sunny and let them wake up. In about three weeks, those little eyes will be leaf buds and it'll be time to move them out the garden. So today I started some potatoes and I finished some potatoes. And thus goes the Great Cicle of Potatoes. Can't you just get potatoes from the store? If you can't get the variety of potatoes you want from the store (not only have I noticed this year a blue variety offered at either Home Depot or Lowe's, but I have both a Whole Foods just past the city limits and a Central market in the city beyond that one), can't you order another variety, and maybe share what you don't use with another gardener. Then you just put aside some of what you grow for the next year. And then you could buy still a different variety the next year, and another one the year after that and so forth. I could look for colored potatoes at a store when it was time to make that multi-colored potato salad. But using store bought eating potatoes for seed potatoes is sometimes problematic - you never really know if they've been treated with something. And I've never seen seed potatoes available singly, only as a bag of at least a pound. I also get new seed potatoes every year. Yes, I could set aside some of last year's crop for this year's starts, but I've read that doing so can result in smaller potatoes and a smaller overall crop. Since I rely on the original 2 lbs of seed potatoes to produce about 50+ lbs of potatoes to see us through the winter, I don't really want to risk my crop size. However, maybe one year I can talk any gardening neighbors into jointly ordering several varieties of potatoes and making up our own mixed collections. It's probably a few years out, though, as I'm still explaining to some of my neighbors that yes, you can grow your own potatoes. Yes, we've all heard that, but I don't think it makes that much difference. I think it's just important that we belive it so that we keep buying the special "seed" potatoes. People who used to farm potatoes didn't go have Home Depot or the Internet to buy them from, they just put aside what they thought they'd need for next year. And the store bought potatoes will still sprout (usually before I'm wanting that to happen), even if they have been treated with something. Sweet potatoes also sprout, thought that takes a lot longer. I don't what would give you lower yeilds. I gave up because of the ants, and it was just too much trouble for something I could get at the store, usually for about ten cents a pound. I'm planning to try again next year with a box I'm building, and if Home Depot doesn't have blue potatoes I'll get them from Whole Foods or Central Market.